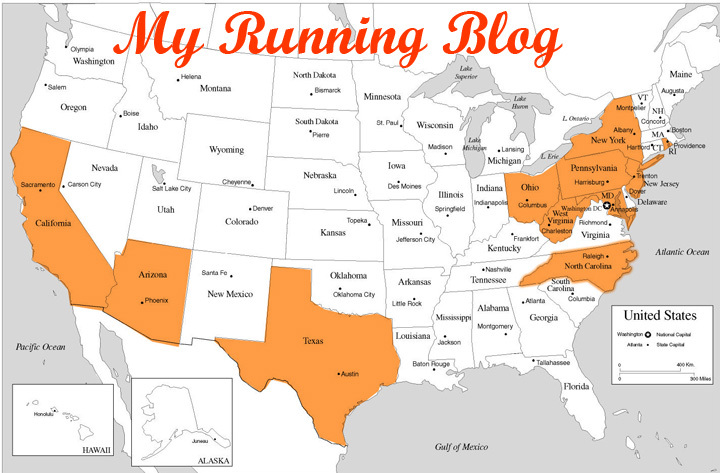 MY RUNNING BLOG: Where I was exactly this morning? Where I was exactly this morning? I used to do my run in the evening when I was back home in San Antonio - which air is cooler (mid-80s) and has more shade. You could say that I got used to the heat. San Antonio only has two seasons, a five-week winter and a 47-week of Sprimmerall (spring + summer + fall). Temp is always "warm" and humid, which built my character when comes distance running. A day's life usually to start of around high-70s temperature, the temperature also high on dew point, which makes you feel so sticky under your skin; humidity is usually under 60% which manageable. It is some what similar to our area. The title of this post was a qustion I asked myself halfway into my run this morning - I thought I was back home and run across Medical Center in the South Texas blazing heat; maybe I was gone out of my mind . This morning, I slept in a little and was sore when I awake; the soreness was from the 11-mile work-out I ran on Tuesday. I knew then I’ll be paid the price by not started running before 0600, so I down about 20 or so ounces of water to my throat; by 0645, I went outside and I felt a warm breeze blow to my face. As I started running, I felt soreness at my calves and hamstring, but I press on. When I get to about 37 minutes, I realized I didn’t bring my head band, and sweat ran down my forehead to my eyes faster than my two feet. I was warm inside, I felt the thirst, and muscle soreness from lack of water. As I run down Woodwell Road and made a right onto Queensguard Road, I saw a MC Mid-County Community Center’s staff was opening up the center; I jogged up to her and ask to use the water fountain – several sips of water was enough to save my run. After I drank, I continue for rest of my run; I clocked 1:08:33 for 9.4 miles, average 7:18 per mile. I drank a big glass of Gatorade with ice as soon as I walk into the house and that felt good. Tomorrow is easy day and Friday’s night is MCRRC track race. I haven’t get on a track since last summer and I don’t know what I will run, maybe I will run a Personal Best in the mile. My weekend long run will be depending how I feel after Friday’s night run: if I feel good, then I will run on Saturday; if not, I will run it on Sunday. I was planning to be an easy week this week, but still likely run up to 50 miles for the week, which a lot for me. For beginning of the week, I ran 53:59 for approx. 8.0~8.5 miles with GRCr in RCP Trail on the Fourth. Tuesday morning, I ran 1:23:51 for approx. 11.6 miles with dozen time-intervals work out. Aside from running early, I know I need to stop playing City Ville every night before bed, which disturbed my resting; silly me and making myself look as another d@#p@$$. I need to get better and force myself not play that thing close to bed time.